An analysis by Bloomberg News and Clarity Campaign Labs found that no candidate is benefitting more from ticket-splitting than the freshman Republican, who is running a tight reelection race against Democratic Gov. Maggie Hassan. An Ayotte spokeswoman said that her bipartisan record in the Senate has countered the caricature that the Hassan campaign has drawn for voters. "While Governor Hassan repeats mind-numbing, recycled Washington attacks and obsesses over Donald Trump, Kelly is criss-crossing the state, going where voters are to talk about the issues they care about and what she's doing to deliver results for our state," spokeswoman Liz Johnson said. The Hassan campaign and Democratic Super PACs have flooded the airwaves of the state with ads tying her to Trump, who trails Clinton by more than 4 points in the state, according to a Real Clear Politics polling average. The campaign has linked Ayotte to Trump on everything from national defense to the nomination of Merrick Garland to the Supreme Court, and has begun referring to Ayotte as "Craven Kelly" in press releases. President Barack Obama and First Lady Michelle Obama have criticized Ayotte and other anti-Trump Republicans in speeches for the Clinton campaign. "Ayotte’s Trump troubles represent just the latest in her long record of putting her own political interests before New Hampshire," the campaign said in an Oct. 14 release. However, the Democrats’ strategy has not had the intended effect: The Bloomberg model projects that Ayotte will receive votes from nearly 10 percent of Granite Staters likely to vote for Clinton. Johnson said that the anti-Trump rhetoric ignores the "fundamental dynamics" of state politics and misses the issues that drive voters, such as the opioid crisis that has made New Hampshire the overdose capital of the country. "Despite months and millions of dollars' worth of negative ads on her behalf, Hassan has been unable to change the fundamental dynamics of this race and it's becoming increasingly clear that her strategy has failed," Johnson said. Ayotte, who had previously said that she would vote for the Republican ticket, encountered pushback after saying that Trump was a good "role model" for children during a televised debate. She later said she misspoke. Ayotte rescinded her support for Trump following the leak of a 2005 video that captured the business tycoon making lewd comments about women. "I wanted to be able to support my party’s nominee, chosen by the people, because I feel strongly that we need a change in direction for our country," Ayotte said on Oct. 8. "I cannot and will not support a candidate for president who brags about degrading and assaulting women." She plans on writing in vice presidential nominee Mike Pence for president. The Pence endorsement may have helped her tighten the polls. An Oct. 12 WBUR poll—the only poll conducted after Ayotte rescinded her endorsement—found the candidates tied at 47. A previous WBUR poll from September showed Hassan leading 48-46. The New Hampshire race is one of the tightest contests in the nation and could determine the Senate majority in 2017. Ayotte pulled ahead of Hassan in September and has led in five of the last eight polls taken since August. She leads Hassan by 2.3 points and is running 6 points ahead of Trump in the state, according to Real Clear Politics. 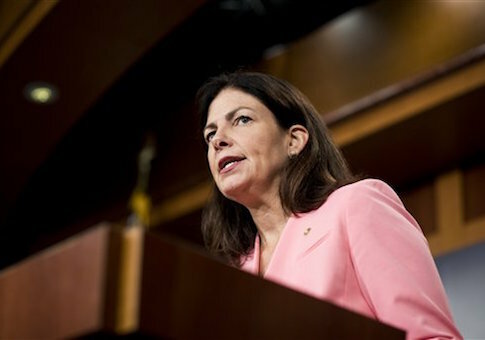 A Tuesday poll released by the Washington Post found that Hassan leads Ayotte by a 47-42 margin. This entry was posted in Politics and tagged 2016 Election, Donald Trump, Kelly Ayotte, Maggie Hassan. Bookmark the permalink.